Chinese culture is one of the oldest in the world today. Over 6,000 years ago this culture began to develop in the Yellow River Valley and many of those ancient practices are still observed in the present. Chinese culture is one of the oldest in the world today. Over 6,000 years ago this culture began to develop in the Yellow River Valley and many of those ancient practices are still observed in the present. The Chinese developed a society based on respect for the spirits of the earth, one’s ancestors, the gods, and other people. It was believed that the world was governed by spirits and deities and so people should behave as though they were in the presence of these spirits at all times. 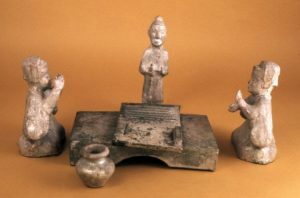 Daily life in ancient China changed through the centuries but reflected these values of the presence of the gods and one’s ancestors in almost every time period. In the prehistoric age (c. 5000 BCE) people lived in small villages in the Yellow River Valley. 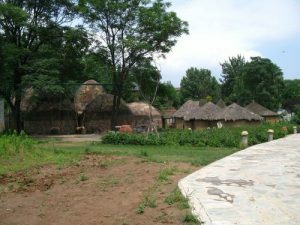 Villages like Banpo show evidence of a matriarchal society, where there was a priestly class dominated by women who governed and were the religious authorities. The people lived in small, round homes built into the ground, wore the skins of animals, and practiced an animistic form of religion. Small villages like Banpo grew into larger communities and then into cities. The Xia Dynasty (2070-1600 BCE) is the first form of government in China which established large cities. It was thought to be mostly mythological until archaeological evidence was discovered which, according to some scholars, proves its existence (although this evidence continues to be debated). After the Xia came the Shang Dynasty (1600-1046 BCE), when writing was developed and the first written evidence appears of what life was like for people in ancient China. Silk is thought to have been invented c. 2696 BCE, when the goddess Leizu, wife of the supreme god Shangti, was having tea and a cocoon fell into her cup. As the cocoon unraveled, she saw it was all one thread and so planted mulberry trees for silkworms to spin their webs in to make silk. The nobles and royalty were the only people who could wear silk. Those who processed the silk into clothing, and even the merchants who sold it, were not allowed to wear it. Most of the population of China wore clothing made of hemp. 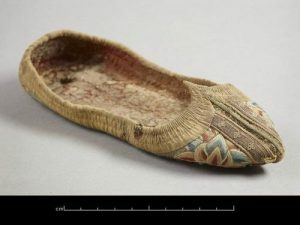 Women wore long tunics which went to their ankles with a tie around their waists; men’s tunics were shorter, only to their knees, and sometimes they wore pants with cloth boots or sandals. In the colder seasons they would wear a thick jacket made of hemp, which was padded for additional warmth. Chinese women would sew an image of a tiger onto the clothing of their children as a sign of protection. The tiger was thought to be the king of the beasts and its image would ward off evil. Sometimes mothers sewed images of toads or snakes onto clothing along with the tiger to add more protection against danger. This practice spread to the upper classes where dragons and tigers were embroidered on silk gowns for the same purpose. In the Sui Dynasty (589-618 CE), the emperor decreed that there was too much similarity between what the peasants and the upper classes wore (even though the wealthy nobles were still the only ones who could wear silk) and passed a law that all peasants had to wear either blue or black clothing; only the wealthy were allowed to wear colors. In Changan westerners operated taverns favored by poets, in the wards along the southeast wall of the city. They employed white-skinned, green-eyed, blond women from Central Asia to sing and dance so that patrons would spend more money on ale. Aside from the taverns inside Changan’s walls, there were pubs where villagers living along some nineteen miles of the eastern road outside the city sold ale to travelers (57). The urban taverns catered to the middle class and the rural to the lower. In the city of Changan during the Tang Dynasty (618-907 CE) there was an area in the district of North Hamlet known as The Gay Quarters, which catered to the wealthy. The word ‘gay’ should be understood as “light of heart”, and the quarters were staffed by high-class and very expensive courtesans. Benn writes, “Prized more, or at least as much as, for their talents as entertainers at feasts than for their sexual services, they resembled Japanese geishas” (64). None of the lower class could enter The Gay Quarters, and if they did, they would not have been able to afford to visit any of the houses. Taverns were often operated by women but The Gay Quarters were run by men accountable to the mayor of the city. This was the standard arrangement throughout China where courtesans were strictly under the control of the government. 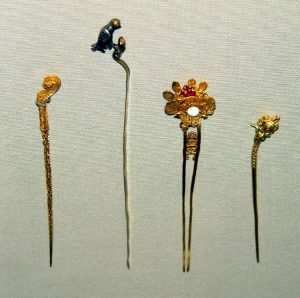 Distinctions between the classes in ancient times were also seen in hair styles and other personal choices. Men and women of all classes wore their hair long because it was thought that one’s hair came from one’s ancestors and it was disrespectful to cut it. In daily life, one would put one’s hair up in a bun, but it was never supposed to be cut. 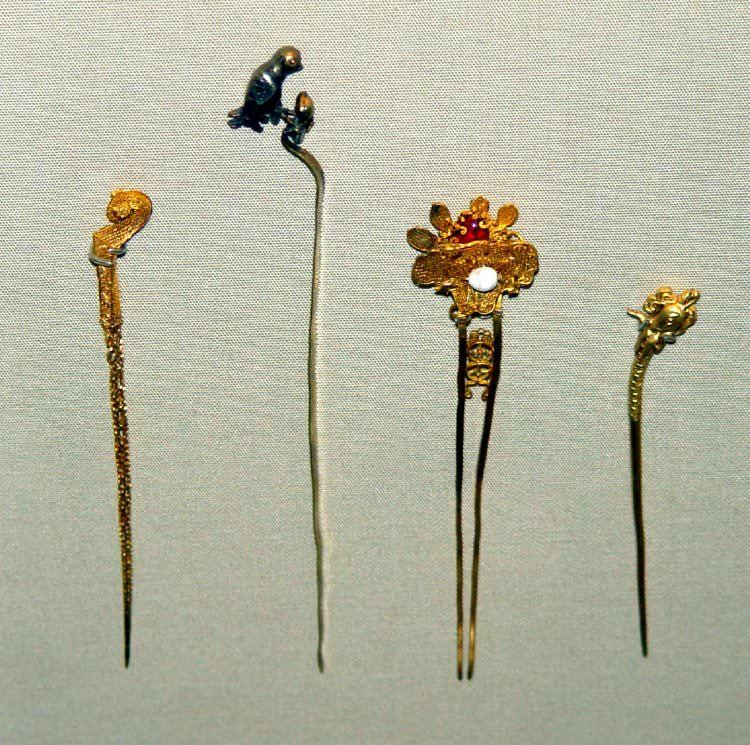 Wealthy women wore their hair up with elaborate pins made of ivory, gold, or silver while poorer women kept theirs up by knotting it or binding the bun with a piece of twine. Just like the hair, the body was thought to be a gift from one’s ancestors and should not be abused. One’s body was not one’s own to do with as one liked; it had to be treated with respect. For this reason, most people looked down on those with tattoos and also because marking the body with ink was associated with barbarian customs. Tattoos were used as a brand for criminals, though, and those branded had to carry the mark with them for the rest of their lives. Even if they had the actual brand burned off, the scar would remain. There are records, though, of quite a few who chose to tattoo themselves as an artistic expression. Charles Benn writes about one man who “spent 5,000 cash to have an artist prick his chest and stomach so that he could sport a landscape replete with gazebos nestled in the mountains, pavillions soaring over rivers, trees, birds, and animals” and another who “had a snake tattooed all over his body in his youth. The image of the serpent began in his right hand, where the jaws of the beast drawn on his thumb and index finger gaped. The body of the snake wound around his wrist, arm, and neck. Then it slithered down his chest, stomach, thigh, and shin, where it terminated with a tail” (112-113). For the most part, though, tattoos were only worn by convicts or gang members. Benn cites an example of a street gang, who had shaved heads and tattoos, who would beat and rob people in the marketplace of Changan. After they were arrested, the mayor had them publicly beaten to death in the town square, and afterwards, many people in the city with tattoos had them burned off so as not to be associated with the gang. Along with tattoos, body odor was also associated with barbarians and criminals, and the Chinese were very meticulous about perfuming themselves thoroughly. Benn writes, “Women and men perfumed themselves. Palace ladies applied scents so lavishly that when they went out on an excursion, the redolence of their cortege permeated the air for miles” (113). They also wore deodorant made of lime, frankincense, cloves, sweet gum, and birthwort. Benn writes, “The compound was packed into small bags that were slung under the armpits. The authorities also recommended washing the armpits with urine on New Year’s Day” (114). Bathing every day was thought to invite sickness, and the custom was to bathe only once every five days. For bad breath, the Chinese sucked on cloves, and it was mandated that anyone appearing in the emperor’s presence had to do so before speaking to him. Foot odor was another concern, which was controlled through perfumes or camphor. The shoes of the wealthy were soft and made of silk, with upturned toes, while those of the peasant class were coarse boots or sandals made of straw, hemp, or wood. Inside the home, everyone wore slippers made either of straw, hemp thread, or silk. Both men and women of the upper classes grew their fingernails long to show that they did not have to work. They had servants do everything for them, even feed them, so they would not damage their nails. Rich women wore jewelry like earrings, bracelets, necklaces, amulets, and rings. Some women pinned the wings of a green beetle to their clothes to make them more attractive to men. During the period known as the Five Dynasties and Ten Kingdoms (907-960 CE) the practice of foot binding began. It probably started earlier but became a custom after the reign of the emperor Li Yu (937-978 CE) who had his consort Yia Niang bind her feet to resemble a crescent moon and perform a special dance for guests at one of his parties. Li Yu had erected a large golden statue of a lotus flower in his garden, and Yia Niang’s dance was to honor its unveiling. Her dance was so beautiful it made the other women there want feet as tiny and graceful as Yia Niang’s were, and soon the idea developed that a beautiful woman should have tiny feet. Girls as young as toddlers would have their feet wrapped in bandages so tightly it broke their toes and curled them under the foot. Girls had to walk around stepping on their own toes and were in constant pain for years until they grew used to it. Although this practice started among the upper classes, it soon became common for all women in China. This made working in the rice fields or doing any kind of manual labor, very difficult. Women are shown in ancient paintings crawling in the rice paddies because they could not walk. Foot binding continued for centuries until it was outlawed in 1911 CE. Many women were interviewed in the late 19th early 20th centuries CE on footbinding and talked about crying from the pain for years and how it never made them feel any more beautiful. The principal crop of China was rice. Rice grew best in the southern part of China in flooded fields, and so canals were dug to flood more fields throughout the country. Rice was so important that it was used to pay one’s tax. Rice was eaten at every meal in some form and was even brewed to make wine. Wheat and other grains were also grown but were never as important as rice. The Chinese diet was (and still is) mostly vegetarian. The Chinese temples and monasteries taught people that a healthy diet led to a long life and emphasized vegetarianism as a humane and healthy way of eating. The Chinese did eat meat but it was rare, and one would never kill a chicken which was still laying eggs. Fish was the most popular dish served with rice and vegetables. 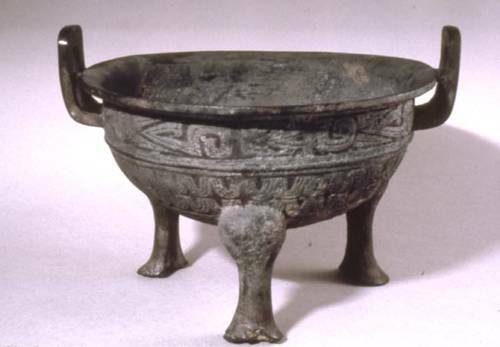 Food was cooked over a low fire in the home in a three-legged pot called a ding. The ding could be placed directly over the fire and ingredients added to slow cook all day so the family would have their dinner ready when they came in from the fields. The wealthy people had servants cook for them who also used the ding but might also use pans and cook with ovens. The most important drink was tea which was first brewed c. 100 BCE from powdered leaves. Different leaves were blended for different tastes or to produce different effects. Tea was considered a powerful medicine but was also just a popular drink people enjoyed and relaxed with. 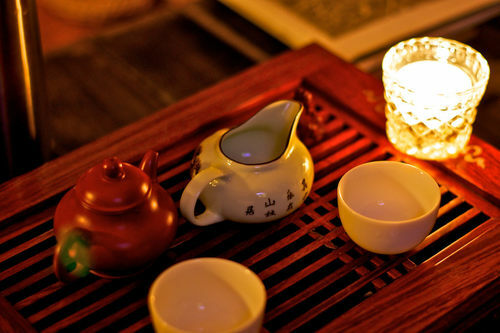 The popularity of tea gave rise to the Tea Culture in China which is best known through the Tea Ceremony. A legend claims that an ancient ruler named Yan Di would go out searching for medicinal herbs to help his people. One day he tasted a herb which poisoned him but, as he was dying, water from a tea tree dripped onto his tongue and cured him. He began planting tea trees after that and gave tea to his people. People would eat tea leaves with their meals as a vegetable, and tea was considered an acceptable religious offering at temples. Tea gardens became popular among the wealthy, and the Tea Ceremony developed, which is an elaborate ritual of respect in which people take tea together. The person who prepares the tea honors her guests through her preparations and presentation, and the guests pay her respect by participating properly. The Tea Ceremony was performed in one’s home or garden where one would welcome guests. The home, just like today, was the center of the family’s life. Women took care of the home while men worked outside of the house. Women, men, and children of the peasant classes all worked in the fields. Chinese homes differed, like anything else, depending on one’s social class and how much money one had. Peasants lived in huts while merchants and other middle-class people lived in houses made of wood, which were built around a rectangular courtyard where a garden would be planted. The garden was usually a border around a patio which had trees and bushes in it. There were sleeping quarters inside the home, a kitchen, and a hall (sometimes very large) which was a dining room and entertainment area. Families would eat in the hall and talk and listen to music or read in the company of their pet cat. Cats were the most popular pet in ancient China, and almost every home had one. Dogs were kept more for security and as a source of food, although there is some evidence that the ancient Chinese played with their dogs as pets. They would also play games like mahjongg, go (a kind of Chinese Chess) or checkers. The Chinese also enjoyed playing kickball, football (as defined everywhere in the world except America), wrestling, and archery. Swimming was not a popular sport in China because of the belief in the type of ghost known as the Shui Gui, the spirit of a person who had drowned who waited in the water to drown someone else in order to be set free. The Chinese did practice swimming but it was not a popular past-time. In every home, there was a shrine to the ancestors of the family, the local Tudi Gong, and the gods the family followed. In the kitchen, there was always the paper image of the kitchen god known as Zao Shen. 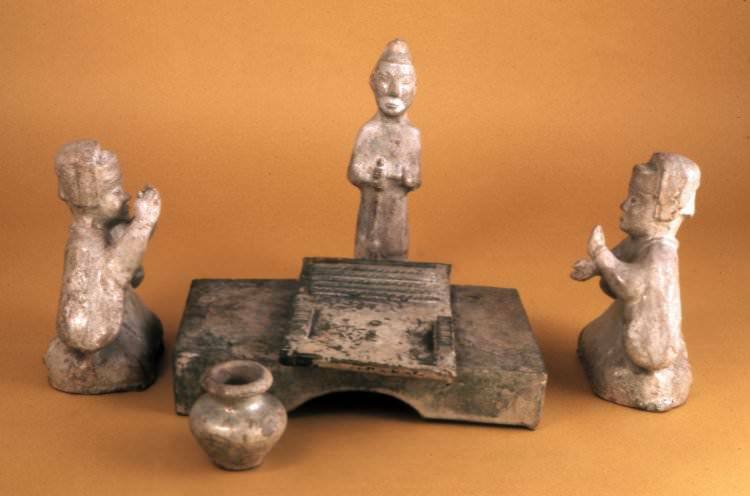 Zao Shen was probably the most important god of the home because his job was to keep watch over the family, keep them safe, but also report on their daily conduct to the other gods. He was like a little spy for the gods in the home, who also protected those he spied on. Once a month, Zao Shen would leave the house to report to the local gods on how the people were doing, and during this time the family was very careful not to do anything to invite evil spirits into the house because they had no protection. Once a year, on New Year’s Eve, Zao Shen left to make his full report to Shangti and the other gods in heaven. His image would be offered food and drink, and then his mouth would be smeared with honey so only a good report would come out when he reached the heavens. The paper image would then be burned to send him on his way, and firecrackers would be lit to make him go faster and give only the best report of how the family was conducting themselves. The next morning, on New Year’s Day, the eldest and most honored woman of the house would make a new image of Zao Shen to place over the stove and keep watch over the family for the next year. Chinese religion began in the prehistoric age when people practiced a form of animism. This practice evolved into ancestor worship and the development of gods and goddesses who personified natural forces. The Tudi Gong were earth spirits one needed to respect and honor at all times. They were the spirits of a certain place, sometimes the spirit of a great person who had once lived there, who blessed those who honored them and cursed those who did not. Veneration of the earth spirits was probably the oldest form of religion but ancestor worship began shortly after or maybe even before it. People who died were thought to live with the gods and had powerful influence in the world of the living. 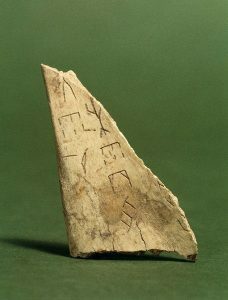 The practice of divination became popular during the Shang Dynasty where people would go to mystics who could tell the future through oracle bones. The belief that those who died lived on also gave rise to a belief in ghosts. Ghosts were (and still are) a very important concept in Chinese culture. The Ghost Festival is still observed each year in China during which people prepare special meals for the departed, burn incense to please the ghosts or drive away evil spirits, and even close their shops so that the ghosts can browse in peace without being disturbed by the living. Tomb Sweeping Day is observed during the Festival of Qingming, (held 4 or 5 April), and is a very old practice. During Qingming, one visits the graves of one’s relatives and shows them proper respect by caring for the grave and leaving gifts including food. If one neglects the graves of one’s ancestors, one risks being haunted by them. The land of the afterlife which souls went to (or, as ghosts, were prevented from reaching) and the heavens and the earth were presided over by gods and goddesses the people worshipped. A very popular goddess was Xi Wang Mu, The Queen Mother of the West, goddess of immortality who lived in a great golden palace in the Kunlun Mountains and had a peach orchard of immortality she walked in. People would wear amulets and build shrines to the Queen Mother to be considered worthy of her protection and the long life she rewarded followers with. Shangti was the supreme god of creation, law, and justice. He was also known as the Yellow Emperor and was thought to have given the people culture and language. Cai Shen was the god of wealth who rewarded those who behaved with a happy life and the Menshen were gods of peaceful sleep who watched over people and warded off evil spirits and bad dreams. Some of these gods and goddesses were worshipped in shrines and temples and others were acknowledged only through charms and bracelets or statues and wall paintings. The Menshen, for example, are still painted on either side of doorways to protect against ghosts and evil spirits. Lei Shen, god of thunder, and Dian Mu, goddess of lightning, were feared while Zhong Kui, the god of healing, was regularly prayed to and worshipped probably as much as Cai Shen. Among the most popular deities were Guanyin, goddess of mercy and compassion who helped everyone and became the patron goddess of sailors, and Niu Lang and Zhi Nu, god and goddess of love who inspired one of the most popular festivals in China, The Seventh Night of the Seventh Moon (also, the Double Seventh Festival), where women would pray for skill in weaving and sewing officially but unofficially was a romantic night for lovers. People would gaze at the stars and tell the story of Niu Lang (the star Altair) and Zhi Nu (the star Vega) who were separated by the Milky Way all year long except on that one night. Astronomers and astrologers both regarded the stars as expressions of embodiments of deities. Astonomers were always male while astrologers could be male or female. Only males received an education in ancient China; which is why astronomers, who were highly educated, were always men. Girls were expected to stay home and learn how to be housewives and mothers. In the early days, young boys stayed home as well and helped with outdoor work, and only young men in their teens attended school and only those of the upper classes. Confucius began teaching young men the principles of how to be the best person they could be, and this set the standard for the basics of Chinese education. Everyone was expected to know the Five Virtues of Confucius by heart. These were Li (manners) considered the most important; Ren (kindness); Xin (loyalty); Yi (honesty) and Zhi (knowing the difference between right and wrong, moral knowledge). In the early days of schools, the students would write on wooden sticks and then on wood scrolls bound together. In 105 BCE paper was invented, and during the Tang Dynasty (618-907 CE) the process of woodblock printing made it possible to mass-produce books of paper, which were then used in schools. The books which were required reading were the texts known as The Five Classics and The Four Books: The I-Ching, The Classics of Poetry, The Classics of Rites, The Classics of History, The Spring and Autumn Annals, The Analects of Confucius, The Works of Mencius, The Doctrine of the Mean, and The Great Book of Learning, most of which were based on the writings of Confucius. Since only men were taught to read and write, and one needed to be literate to read medical texts, doctors were also all males by the time of the Tang Dynasty. Herbalists in rural areas could be women but the medical profession was dominated by men. Most doctors were priests or had a background in religious practices. Prior to the Tang Dynasty, doctors were essentially shamans who cured the sick through herbal remedies and exorcisms. They believed illness was caused by evil spirits or ghosts. After Buddhism arrived in China, Buddhist priests presided over establishments known as Fields of Compassion which were hospitals, clinics, orphanages, retirement homes, and counseling centers all at the same time. These were usually operated out of or adjoining a monastery. The second emperor of the Tang Dynasty, Taizong (626-649 CE) established medical schools and added the medical profession to the list of occupations one needed to pass the Imperial Examinations for. These doctors were more secular than the earlier shamans and were held to a high standard of conduct. A long and healthy life was greatly valued by the Chinese. Priests, monks, shamans, and secular doctors all emphasized diet as the most important factor in a person’s health. A vegetarian diet was considered the most healthy and also the most humane in that one was not killing animals to sustain one’s self. People did eat meat and often sacrificed animals to the gods and spirits, but doctors, especially secular physicians, discouraged this. The prevailing belief in the Tang Dynasty was that a long and harmonious life of balance could only be achieved by refraining from meat dishes and living off the gifts of agriculture which the gods had given to people. In gratitude for these gifts and all the others the Chinese honored their gods, and to celebrate life they held a number of festivals throughout the year. There were national festivals, which everyone observed, regional festivals, and local festivals. A local festival might be a celebration of the birthday of some famous citizen who had done good works for the town or a poet or artist. Regional and local festivals could also be held to honor the Tudi Gong. Taoist festivals were observed to cleanse a village, town, or city of evil spirits, to appease the restless dead, or honor the ancestors and invite their blessings. 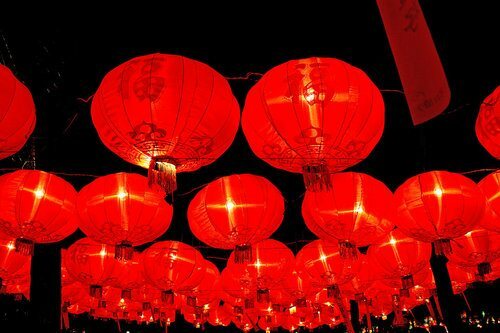 The most important national festival was New Year’s Day, which was observed between the 1st and the 15th days of the first lunar month. Firecrackers and fireworks were set off to welcome the new year and to speed Zao Shen on his journey to the heavens. These fireworks also served to drive away evil spirits. The firecrackers were dried bamboo, which were thrown into fires early in the morning and popped loudly when they burned. Every home would set off firecrackers and, if they could afford them, fireworks but each municipality had some kind of public fireworks display. New Year’s Day allowed for people to slaughter chickens and sheep on a large scale to ensure fertility of the land for the coming year. Government officials were given a seven-day vacation, and shops closed or operated on limited hours. The focus of the festival was to give thanks for the past year and make provision for the new one. This provision emphasized protection against evil spirits and ghosts. Slaughtered chicken and sheep skins were hung up outside of homes as offerings, incense was burned, and a special ale was brewed called Killing Ghosts and Reviving Souls. Drinking this ale in large amounts was thought to protect one from illness caused by evil spirits or restless ghosts. Patricians sought to outdo each other in providing the grandest lamps. An aristocratic lady of the mid-eighth century had a lamp tree with several hundred branches that was eighty feet tall. When she lit it on Lantern Festival, its light was visible for miles. It could not compare, however, with that of Emperor Ruizong. He had a lantern wheel 200 feet tall erected outside a gate of Changan in 713 CE. The apparatus was clothed in brocades and silk gauze, and adorned with gold and jade. When he had its 50,000 oil cups lit, the radiance burst forth like the blooms on a flowering tree (151). If one could afford it, no expense was spared in celebrating the Lantern Festival. A good festival would mean prosperity for the coming year. There was also the Lustration Festival which took place on the third day of the third moon when the people drove away evil spirits by drinking enormous quantities of ale. The entire day was devoted to feasting and drinking to excess. The Qingming Festival was observed in April honoring the ancestors, and the Fifth Day of the Fifth Moon Festival (Dragon Boat Festival) was held in July to honor a respectable statesman who chose a dignified death over a life of dishonor. The Hungry Ghosts Festival, in August, recognizes the spiritual dimension of life and honors those who have passed on. The Seventh Night of the Seventh Moon Festival honored the god and goddess of love, and the Mid-Autumn Festival paid tribute to the moon. The Last Day of the Twelfth Moon Festival was the ritual of sending Zao Shen on his way to the gods on New Year’s Eve and corresponds to many New Year’s Eve parties in the present day. People began drinking the Killing Ghosts and Reviving Souls Ale, had feasts, and lit off fireworks. Festivals kept the people in touch with their past, grounded them in their cultural values, and were a very important aspect of the lives of those in ancient China. In the present day, many of these same celebrations are observed every year. The rituals involved go back hundreds or even thousands of years and continue to be performed in very similar, or exactly the same, ways. This entry was posted in Ancient, China, Chinese, History. Bookmark the permalink.